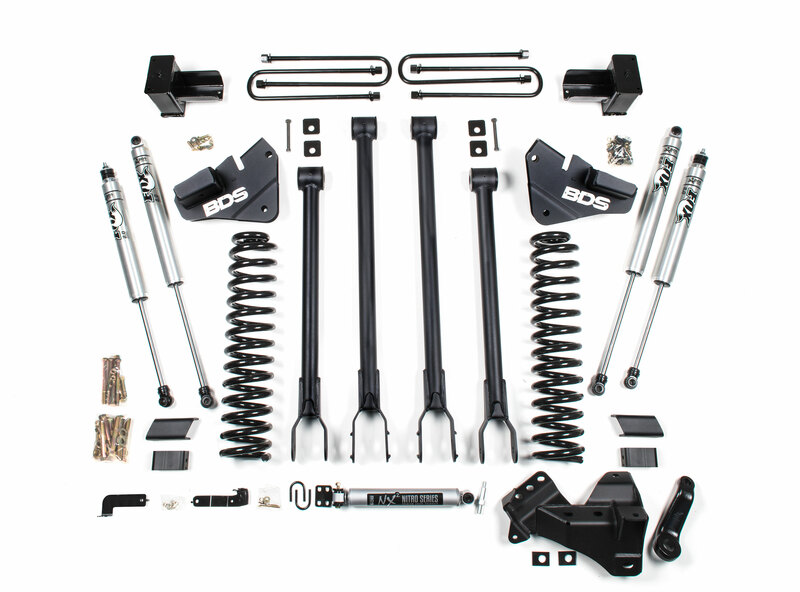 BDS Suspension expands its lineup of kit offerings for the redesigned 2017 Ford F250 and F350 Super Duty 4wd trucks with new 4" 4-link lift systems. These join the existing 1" & 2" leveling, 4" radius arm and 6" 4-link lift options. Designed to improve offroad performance and allow for fitment of up to 37s, these new 4" lift options maintaining on road ride quality, handling, and comfort. As with all BDS lift kits, these 4" lift kits are backed by Factory Protection Plus for peace of mind wherever your adventures may take you. Factory Protection Plus includes BDS’s exclusive No Fine Print Warranty along with a 5-year, 60,000-mile drivetrain warranty. 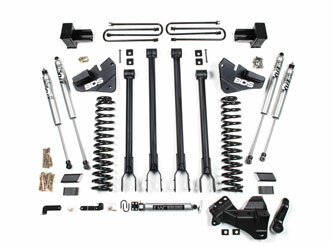 Get the lift and the look you are after with these new 4" 4-link lift kits from BDS Suspension. *Other wheel/tire combos can be used, but additional trimming to the front lower valance and/or inner fender may be needed. 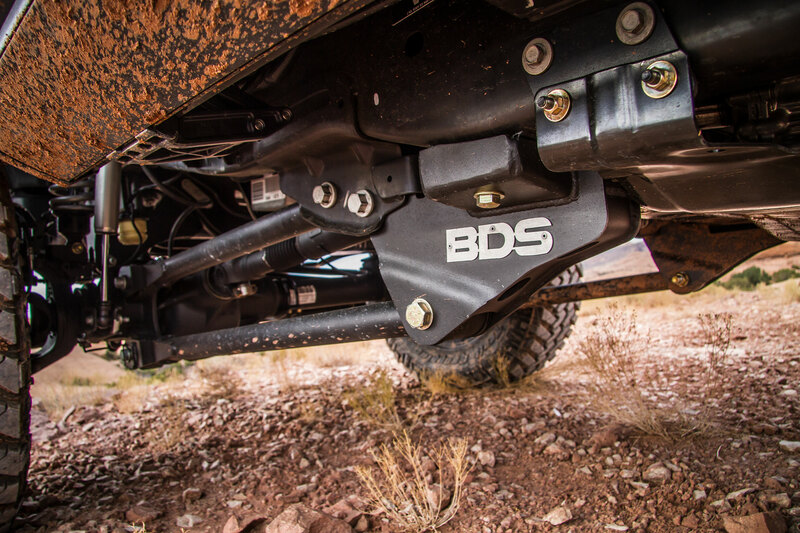 BDS 4" 4-Link Lift Kits: The newest addition to BDS Suspension's lineup for the 2017 Ford Super Duty are 4" 4-link systems adding to existing 1", 2" 4" and 6" lift options. These new 4" systems use a heavy duty 4-link control arm conversion to upgrade the factory stamped steel radius arms for improved strength, handling, and caster control. This new setup is based off the tried and true 4-link setup from '05-16 Super Duty kits, now designed to key off the factory frame bracket (no need to remove factory bracket) for 4" and 6" lifts and ties into the frame rail and transmission crossmember for an extremely rigid control arm mount. The brackets are build from high strength 1/4" steel, come fully welded and finished in a durable textured black powdercoat with riveted BDS nameplates. The upper and lower control arms are built from heavy wall 2" OD DOM steel tubing with massive 2-1/2" greaseable frame mount bushings and reinforced clevis mounts to attach at the axle. The extra ride height comes from a pair of 4" ProRide coil springs designed specifically for the weight of the diesel or gas engine equipped trucks for a smooth ride paired with your choice of specially tuned BDS NX2 series gas shocks or the premium FOX 2.0 IFP performance gas shocks. For steering correction a forged drop pitman arm and heavy duty track bar relocation bracket are supplied. This brings the drag link angle closer to factory and keeps the steering angles in line with the relocated track bar for improved drivability and a recentered front axle. Also supplied for the front are bump stop extensions to limit suspension compression, sway bar drop brackets to correct the sway bar positioning, and brake line relocation brackets to allow the use of the factory brake lines to speed up installation. In the rear of these 4" systems BDS offers a replacement 5" rear block kit for both the OE 2-leaf main spring pack and OE 3-leaf main spring pack equipped trucks. The blocks are built from high strength, fully boxed steel with an integrated bump stop wing. Both the blocks and u-bolts are finished in a durable black e-coat finish. Finishing off the rear of this kit are a pair of matching NX2 or FOX 2.0 gas shocks to compliment the front setup for all around impressive performance. These new 4" 4-link systems allow for clearance of up to 37" tires. Take your 2017 Super Duty to the new levels with BDS Suspension. Hello. What are the brand and size of the wheels and tires of the black truck in this 4′ BDS ad/press release? I am doing the 4′ on my 2017 and what this exact set up. Please LMK asap. 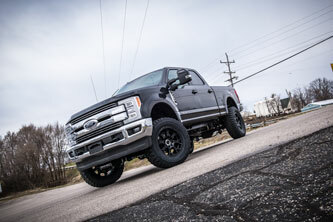 the black F250 is running the 4″ lift kit, 37×12.50 Toyo R/T tires and 20×9 wheels. I don’t recall the make/model of those particular wheels, they were supplied by the vehicle’s owner during testing.